Are you ready? It's time for my weekly Simply Stampin' Up! feature! Thursday is the day I take a published Non-Stampin' Up! 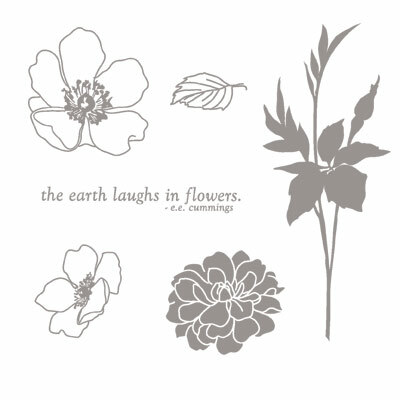 stamping project and re-create it using ALL Stampin' Up! products. I've really been enjoying this each week. 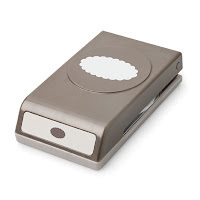 There are so many beautiful projects out there, but so many of us don't use anything but Stampin' Up! 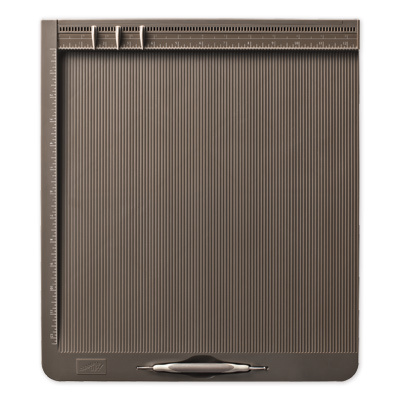 I love being able to get the look of the published project using the quality products I love most! Wanna see how it all came together? Ok! Let's go! Layer 1 - I took a piece of Naturals Ivory cardstock and cut it in half at 4 1/4" x 11". Using my new Simply Scored scoring tool, I scored it at 5 1/2" to make it easy to fold in half for my card base. Card size is 4 1/4" x 5 1/2". Using my Corner Rounder Punch, I rounded the top two corners of the card base. **TD Tip - It is not recommended that you punch two layers at a time with any punch. Please note that doing this too many times may damage your punch. Next, I sponged the edges with So Saffron Classic Ink and a Stamping Sponge and set it aside. Layer 2 - I used a piece of Old Olive cardstock and cut it at 2 1/2" x 5 1/2". The edges were sponged with So Saffron ink. Layer 3 - Taking another piece of Naturals Ivory cardstock, I cut it at 2 1/4" x 5 1/2". I inked up my En Francais background stamp with So Saffron ink and stamped this piece of cardstock. **TD Tip - I find that stamping with background stamps is much easier when I lay the stamp on it's back and ink it up with either the ink pad direct to it or inking my Brayer and rolling the color onto the stamp. Next, I carefully lay the carsdstock on the inked stamp and hold it in place while folding over one side of my Grid Paper over it. I then smooth over the outside of the Grid Paper, which not only transfers the image to my cardstock, but keeps my fingers clean of ink! Next, I inked up the open flower from Fabulous Florets with Basic Black Classic ink. I stamped it twice on the cardstock. I then inked it up twice again and stamped it on two sticky notes, cutting them out to create 'masks' for my images stamped on the cardstock. 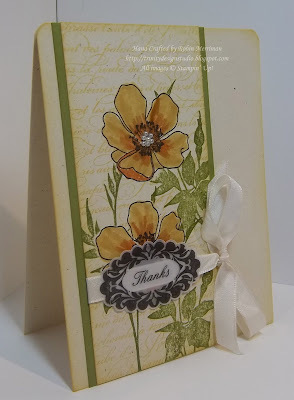 I placed the masks over the stamped images and then inked up the stems from the stamp set with Old Olive Classic Ink. This image was stamped several times, re-inking each time, over the masked flowers. When I removed the masks from the flowers, it appears that the stems are behind the flowers. This technique is so easy and so cool! Now, I'm no whiz with watercoloring - not by a long shot, so I simply colored these flowers with my Stampin' Write Markers. If you don't look real close, they aren't too bad! HA! I used Peach Parfait and So Saffron for the coloring. I also sponged this layer with So Saffron ink. Once that was done, I filled in the center of the top flower with Basic Pearls - the tiny ones. I love having a use for those sweet little things! So, two more things about this card. I chose to wrap my ribbon around the outside of the top cardstock layer because of the greeting I used. 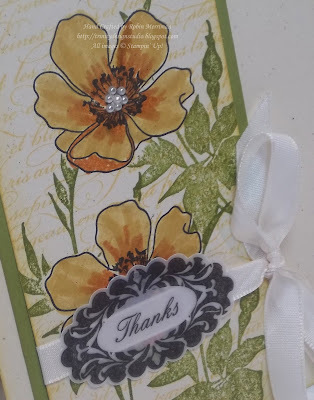 I chose the thanks sentiment from the Perfect Punches stamp set and stamped it in Basic Black on Vellum cardstock, punching it out with the Scalloped Oval Punch. I wanted the ribbon behind the greeting to make it stand out a bit more. 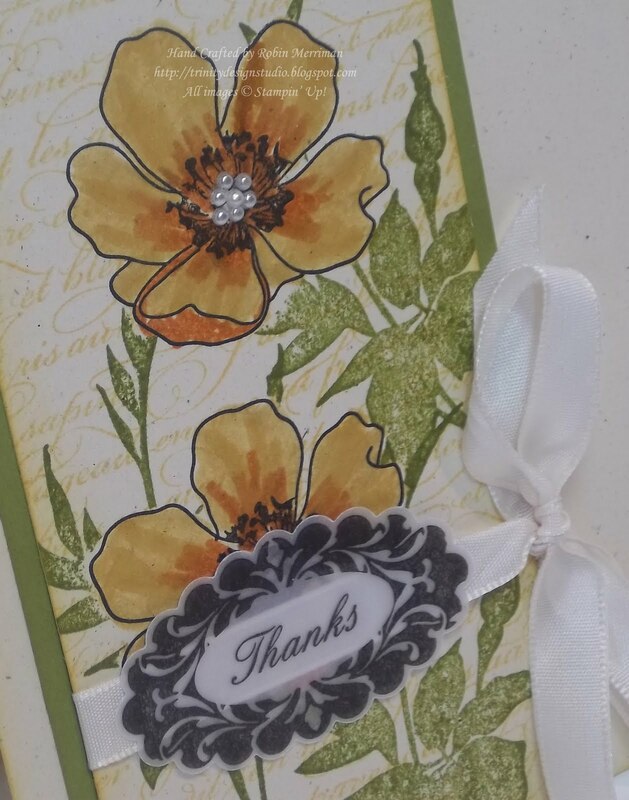 After tying the ribbon bow with Very Vanilla Taffeta, I simply used Mini Glue Dots to adhere the greeting to the card. The original card used staples to adhere the vellum greeting and my preference was to not do that. 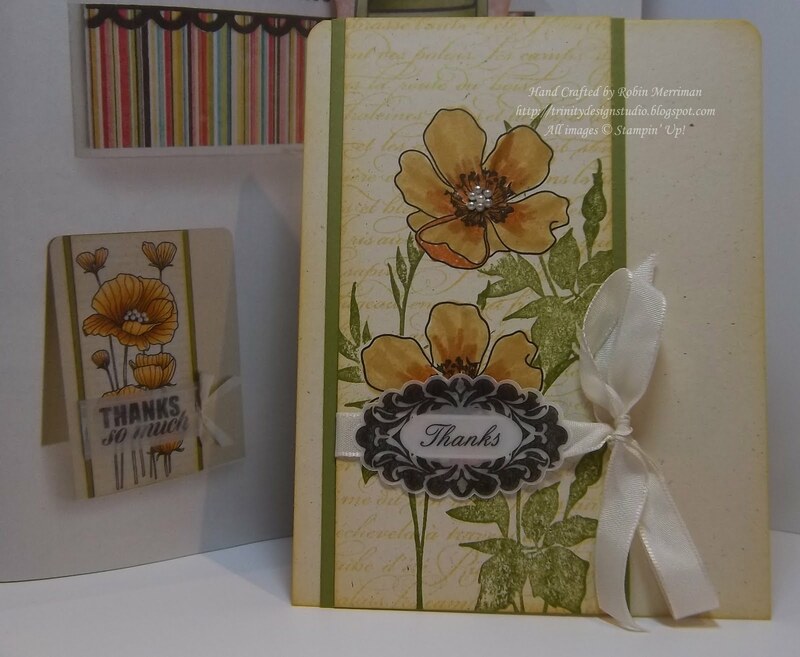 There you go, this week's Simply Stampin' Up! card. 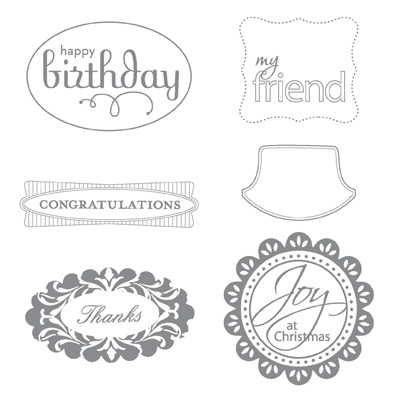 As always, you can order these and all other Stampin' Up! 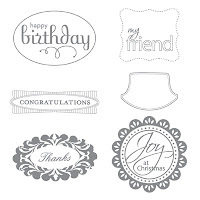 products from my Online Stampin' Store. It's open 24/7 to make it easy for you to get the products you love! Have a great Thursday - I'll be back with another Christmas project for you tomorrow! Woo hoo! I have all of the major things necessary to CASE this BEAUTIFUL card! (I am missing a few of the exact details, but I can substitute.). Thank you Robin. I like your version better than the one in the magazine. 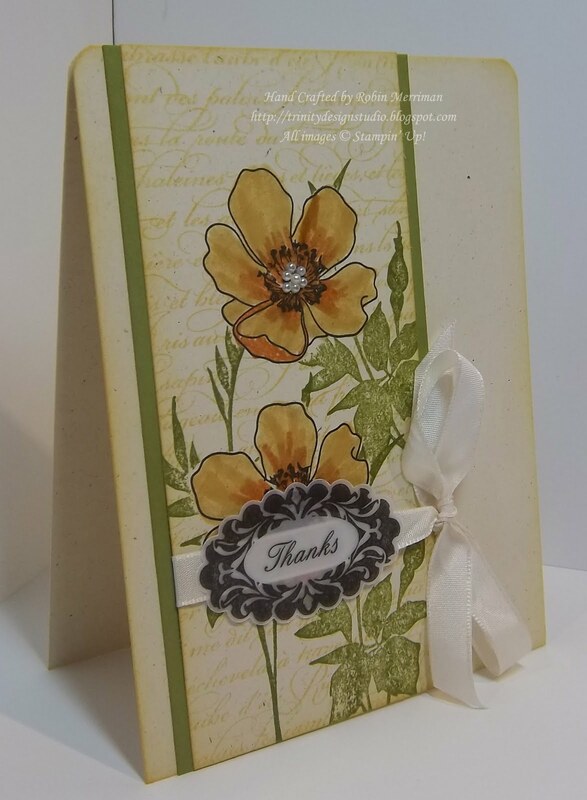 Love your card and the way you re-created it using SU products. I like your card better than the original, good job!! Beautiful! I will be adding this to my faves. ~Lindsay G.